When designing the recovery system for a rocket the maximum forces must estimated. There are two main considerations, the deceleration of the separating parts of the rocket as the shock cord goes tight and the deceleration of the rocket as the main parachute deploys (in dual deployment systems). Firstly the separation velocity must be found. This can be calculated if the pressure causing separation and therefore force acting to accelerate the components of the rocket are known using newton’s laws (remembering there are two parts of the rocket being accelerated). 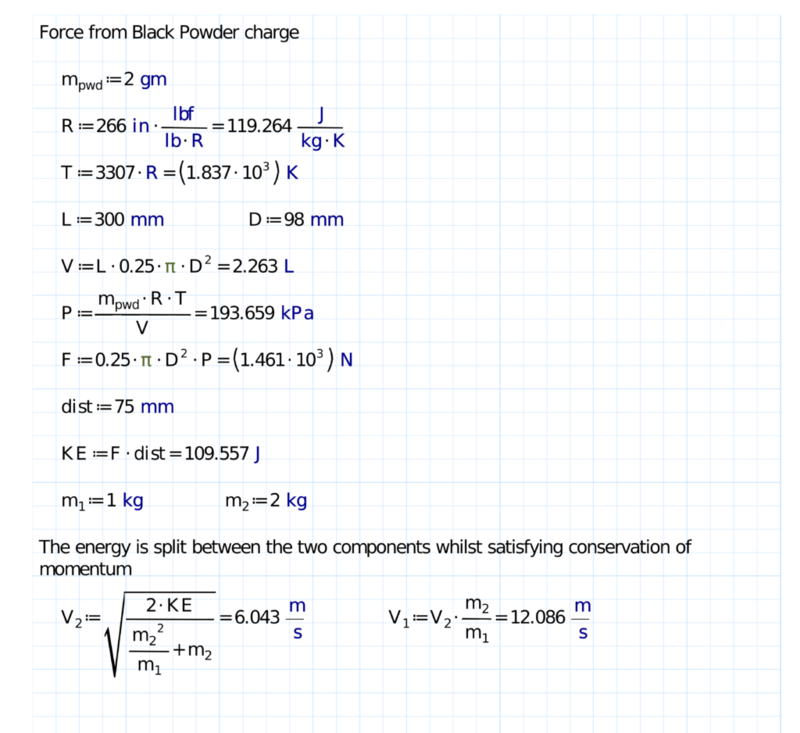 Estimating the pressure for standard black powder charges is tricky, there are some approximations to a gas equation around (eg http://www.vernk.com/EjectionChargeSizing.htm). I’d really like to set up a controlled experiment with some BP charges and a pressure sensor. Next consider the deceleration as the shock cord goes tight, this can be model as two mass connected by a spring of stiffness k, length L and extension delta. 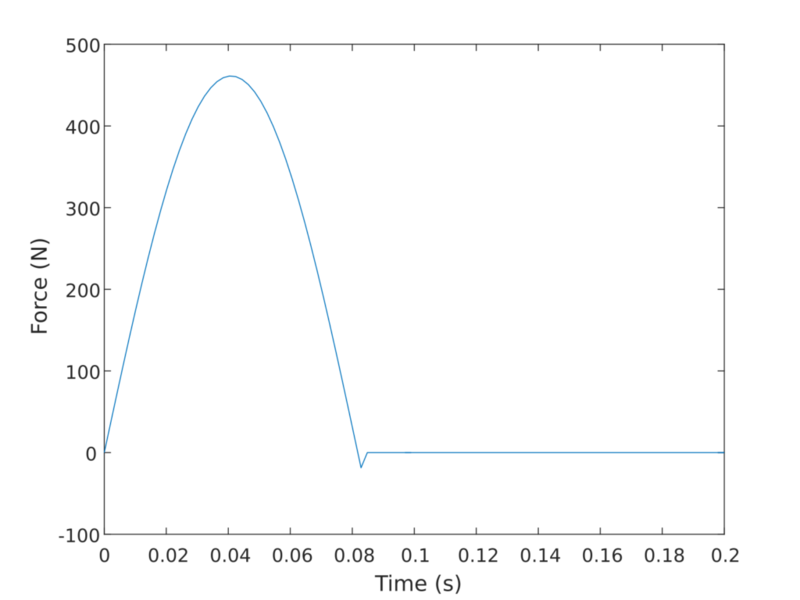 Using the velocities from the previous calculation and iterating the differential equations using this Matlab script listed below produces the below graph of force against time (should also work in Octave). The graph is for a shock cord 3m long and made of 5mm diameter nylon cord. The next consideration is when the main deploys, the rocket is descending at the terminal velocity of the drogue. 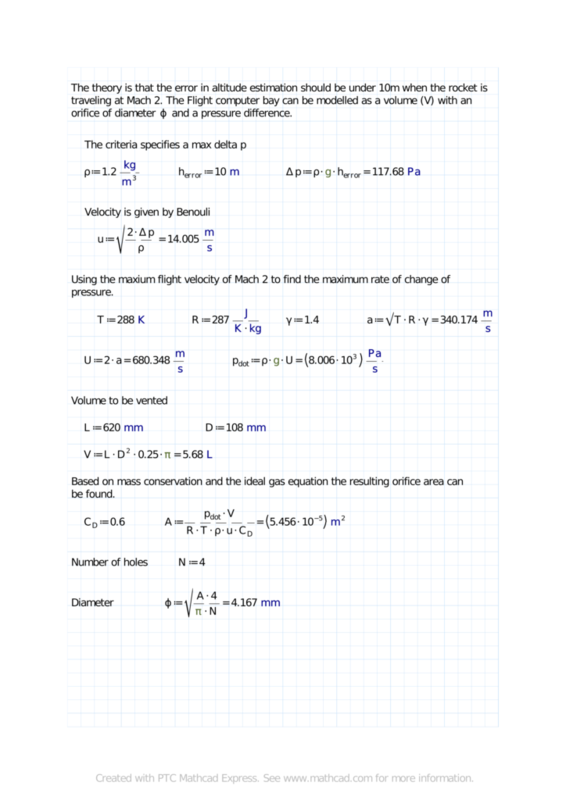 The main then deploys, the velocity is higher than the new terminal velocity therefore the rocket decelerates. The force is simply given by the drag from the main at the terminal velocity of the drogue. It is important that vents are drilled in the rocket so that the barometer on the flight computer can sample the atmospheric pressure (and calculate the altitude). There are various rules of thumb for sizing such ports but few explanations from first principles. Intuitively (or based on dimensional analysis if you will) there must be a ratio between the volume to be vented and the area of the vents. One rule of thumb is one 1/4” diameter hole for every 100 cubic inches. An approach based on first principles goes like this. First decide on the maximum allowable error in the altitude, say 10m. This provides the pressure difference between the altimeter bay and the free stream. Next find the maximum flight speed, this gives the maximum rate of change of pressure. Modelling the altimeter bay as a volume V with an orifice area A and pressure drop delta p this gives all the information needed based on Bernoulli’s equation for the flow through the orifice and mass conservation. This Mathcad sheet calculates the size of the vent holes. (Mathcad Prime Express can be download for free). Based on an error of 10m and a flight velocity of Mach 2 the calculation yields a 0.176″ hole for every 100 cubic inches, a fair bit less than the rule of thumb above.